I've never really felt like Supermom. SuperOverwhelmedMom? Much too often, yes. I want to say that I'm a "do the best you can and most things will work out" kind of mom, all laid back and relaxed.....but I'm totally staying up late at night with anxious thoughts about all the things that didn't get checked off of my list that day. 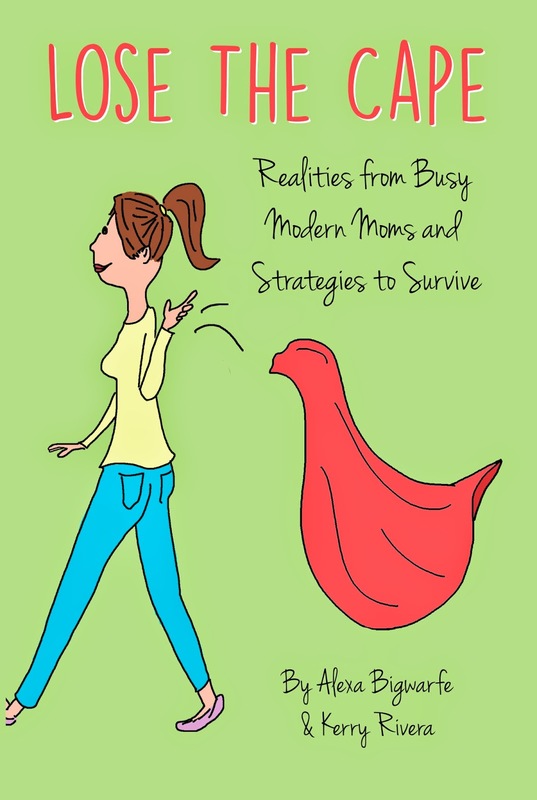 So a book called Lose The Cape: Realities from Busy Modern Moms and Strategies to Survive was something I couldn't pass up reading. Even if I never felt like I had a Supermom cape to begin with. Plus it was written by two amazing bloggers, Alexa Bigwarfe and Kerry Rivera, and I love it when bloggers get published! So here's the lowdown. Cape or not, even if you are too busy to figure out if Supermom should be written as one word or two (Supermom? Super Mom? SuperMom? ), if you are a mom, or are thinking about becoming a mom one day, you need to read Lose The Cape. It is like sitting down with two supportive friends who are willing to give you all of their nonjudgemental advice and encouragement. Every chapter is full of real and actionable tips to help you get organized, develop a system, make (reasonable) plans, and generally rock this motherhood thing YOUR way. Because that is a big theme of this book - realizing that every tip and every idea will not work for every mom. Once you accept that, it becomes easy to focus on the tips that ARE a good fit and actually do something with them. You can order Lose The Cape from Amazon now. And don't forget to check out the Lose The Cape blog and podcast, too. It is a great place to find other moms and see how other moms are making life work (or submit your own stories - they love guest posts). In the spirit of Lose The Cape, share one of your best parenting or life tips in the comments! *Disclosure: I was provided with a free copy of Lose The Cape. I was not required to say nice things about the book, stalk the writer's blogs, or stay up way too late reading and making notes about tackling household chores. Sounds like a great read. I am sure I will be able to relate to a lot of it. Love the sound of this book! It's great to read something from someone who knows exactly what your life is like. Sounds like a great book for all the moms in my life. Sometimes we have to allow ourselves to not be superheroes! Be present.. tell them you love them always, forgive.. have fun. It goes by far too quickly! I love the concept this book is based on. I've always thought I was a laid back, go with the flow kind of mom, but we've had a couple of big things happen in the family recently that just left me frantic and looking for a dry cleaner to clean my superhero cape (so I could hurry up and put it back on ;) ). hear hear!! I lost my cape ions ago! haha! I'm super overwhelmed mom for the record! Sounds like I need to add this to my summer reading list! I love the title of this book! It sounds like a great read! ha! That disclosure! I had the same experience with reading and reviewing this wonderful book. i really need to get into reading again and just take a break from it all. I love that this book is supportive of other moms. There's too much feuding among moms these days. This sounds like a great way to be compassionate towards one another. My best parenting tip is not to get to caught up in the small stuff when dealing with your kids. Sometimes you need to learn to pick your battles. The title alone has gotten me sucked in! This looks like a really fun read. Sleep. that is literally the breaking point for me and my kids. If I do not sleep my kids and I struggle.